Over the weekend, Dan’s parents came to visit us and we gave them their belated birthday present – a home-cooked dinner made by yours truly and my hubby. While celebrating their birthdays back in July, we gave them a bottle of wine (to BYOB for the dinner) and a sample menu where they could pick from a few choices for an appetizer, an entree, and a dessert. All would be made by Dan and I and ready when they got to our place. Honestly, the prep time wasn’t too long, and we definitely blocked out the day for cooking (and cleaning to make our apartment presentable!). The appetizer was the easiest. 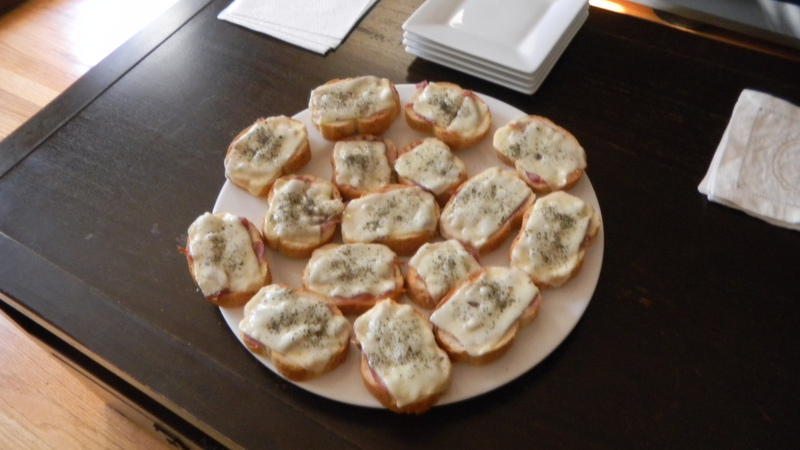 We put some prosciutto and deli mozzarella (not the fresh kind because it’s too watery) on top of some baguette slices and sprinkles the top with basil. I put those in the oven for about 7 minutes at 350, which was until the cheese melted. The next easiest was the dessert. 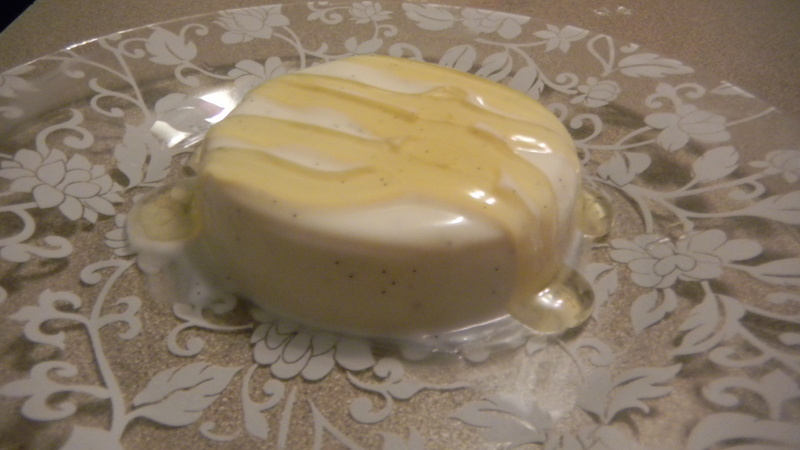 We’ve made the panna cotta before, so it wasn’t a challenge. The garlic knots also were a breeze. My secret? Store bought pizza dough from Trader Joe’s. 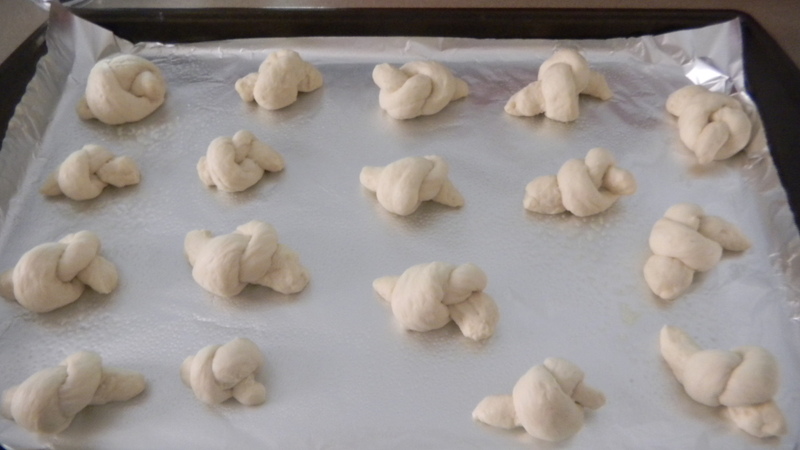 I sliced the dough, rolled it, and tied it into these cute little knots. 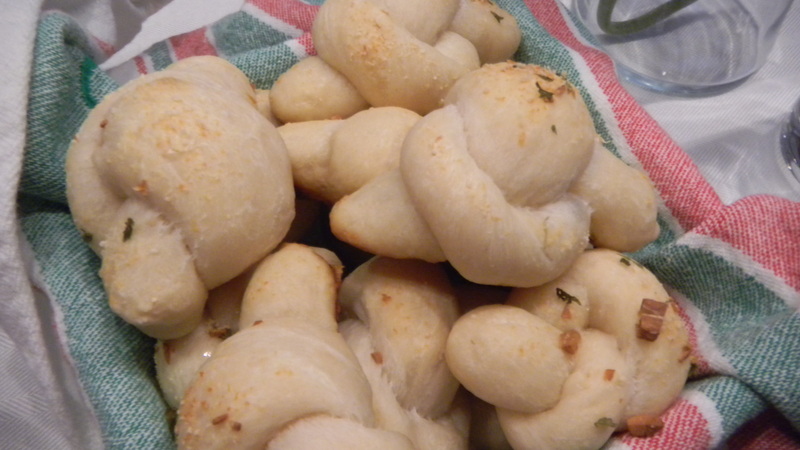 I sauteed 4 cloves of garlic in olive oil, then brushed the mixture on top of the knots before baking them. I also added parsley and a bit of freshly shredded Parmesan cheese. Bake those for about 8 minutes at 350. The most time-consuming was by far the mushroom ravioli. We handmade the spinach dough and made the mushroom filling from scratch. 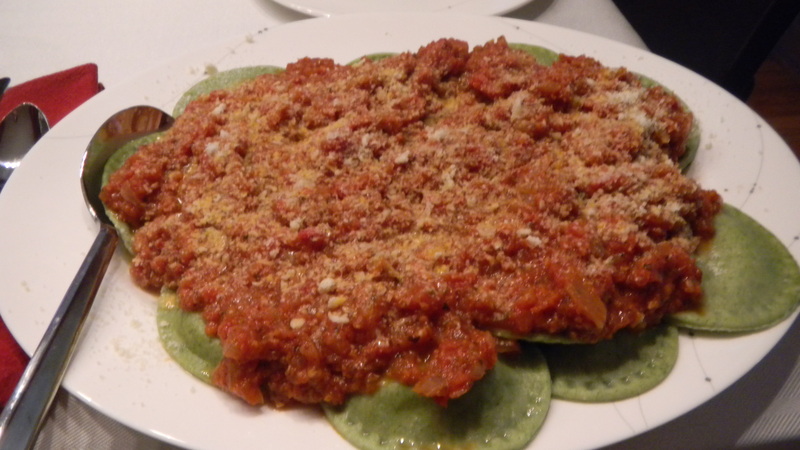 We topped the ravioli with some of my marinara sauce, which is Giada’s basic recipe with my own little tweaks. As for decor, I kept it really simple. A single white daisy in a glass vase. White tablecloth. 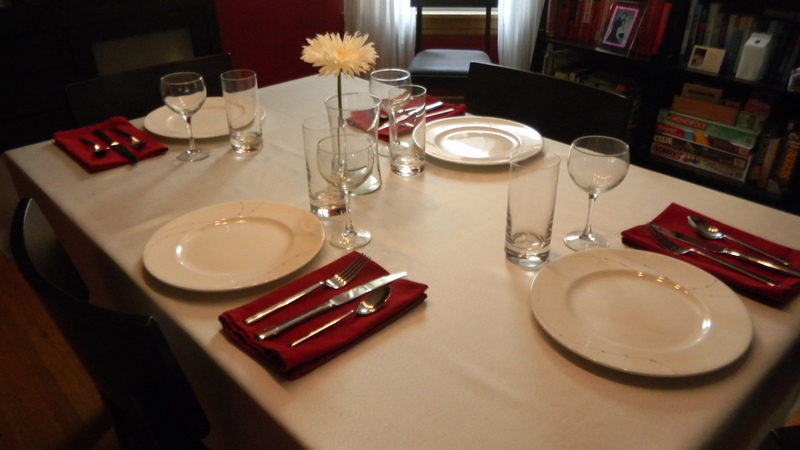 Bold red cloth napkins. White china/serveware. I read somewhere that white plates really let the food stand out, and I totally agree. This is the first time I really focused on that, and I was really happy with the results. I’ll be sure to use that tip again in the future. It was a fun night with family and food. Yummmmmmm! Your dinner looks amazing. I’ve used Giada’s recipe, too, and like it very much. She also has (please don’t kill me) about 4 varieties of jarred sauce that are sold at Target. The creamy tomato sauce is excellent – I think the secret is that there is some cheese in it. I tried her veggie marinara sauce though and thought I’d definitely prefer making it myself to that. I don’t know why I am telling you this when you have Italian relatives that can supply you with delicious sauce, but I guess I have Giada on the brain, and I love her creamy sauce- haha! Thanks for the comments, Lauren and Cindy!Lauren – I won’t speak of canned sauces. I think we all know my opinion on consuming them myself, but I’m sure they are actually not as bad as I think they are, and they are certainly less time consuming. Though I do have to say – the sauce I made can easily be prepared in less than an hour and a half in a pinch. Just the longer it cooks, the better the flavors blend.Cindy – You are most welcome. I’m glad you enjoyed your belated birthday celebration.